There are several powerful tools to have a cleared nose and stop mouth breathing and snoring for good. Hundreds of my patients can testify about usefulness of these techniques. These remedies include correct diet, physical exercise (with 100% nose breathing), good sleep hygiene, garlic solution remedy, and an amazing breathing exercise that unblocks the nose in 1-2 minutes. All these methods are to increase body oxygen content. You can have a completely clear nose all day long and all night long as soon as you have enough oxygen in body cells. There is a simple test and a criterion (a number measured in seconds) that provides a guarantee of success. I successfully tested this natural remedy on hundreds of my breathing students while teaching one breathing method with the idea to achieve … medical norms for breathing at rest. It is that simple: if you have normal breathing (and normal o2 levels in the body, head and sinuses), your nasal passages are clear all the time. If you breathe differently (and have less O2 in the body), the sinuses and airways get blocked. 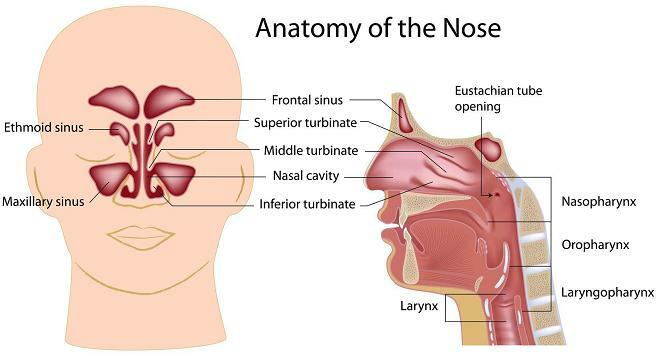 Here is a simple anatomy of the upper airways and sinuses. Problems with a blocked nose get more severe during sleep (at night) with more snoring and sinusitis due to causes that are explained on pages of this website. It is also known that nasal congestion becomes more bothersome after meals or due to eating. Some people can testify that stress and anxiety worsen the symptom. All these observations make total sense if one knows the cause of stuffy nose problems. However, the solution and the answer is in the way we breathe. These sinusitis remedies and treatment options are based on clinical work of over 170 medical professionals and personal testimonials of their patients who were real sinusitis sufferers. The remedy and treatment for a stuffed-up nose that we are going to discuss here was tested in 6 clinical controlled randomized trials for people with asthma. In fact, these were 6 most effective ever-known clinical trials for asthmatics. In these trials, asthmatics were able to reduce their use of medication (bronchodilators or puffers, such as Ventolin, and other medication) by about 90%. These studies also revealed that there was a nearly complete disappearance of symptoms in those asthmatics who applied this natural treatment. But problems with a blocked nose is one of the key symptoms in asthmatics! 5) breathing normalization as the ultimate or permanent cure. If you search for “stuffy nose” on YouTube, here is one of the top videos that provides the best even known home remedy: Stuffy Nose Remedy.